Himalaya Journey Treks & Expedition Specialized in operating Bhutan adventure package tours & trekking in Bhutan and providing the services of air ticketing in the international market, we promote environment friendly travel that is in harmony with Bhutan's distinctive culture and traditions. If you are looking for a unique and unforgettable experience, let us give you an intimate insight into Bhutan's simple and pure way of life. 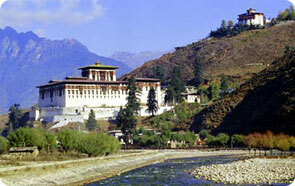 Bhutan is one of the world's most exclusive tourist destinations! HJT adventure tours in Bhutan will takes you to unique aspects of Bhutanese culture including visits to the sacred festivals, ancient monasteries and historical pilgrimage sites. We custom design our tours for your specific desires and can range from casual short walks to exotic Himalayan treks. HJT fascinating excursions to remote villages and breathtaking temples amidst the animated festivities takes the nature lovers closer to nature than thought possible. Our guides, well equipped with fluent english and knowledge on the Bhutanese local traditions and flora and fauna are bound to take you through an experience that will last you a life time. Whether you come to Bhutan for our Culture, Trekking and Mountaineering, Arts and Architecture, Festivals, Dance and Music, Landscapes, Spirituality, Buddhism, Flora and Fauna, People, History or just to get away from the rest of world… we would like to make your visit the Trip of a Lifetime! Since Bhutan tourism is open from 1974 ,Himalaya Journey Treks and Expedition Nepal, with great effort of team , professional staffs who are experience and experts in their field, their knowledge of Bhutan and the level of service that we provide for our clients is unsurpassed. We always pride ourselves on providing the best available accommodation, transportation and guides while our valued clients in Bhutan tour.